that they are working in harmony. Why Won’t the Landlord Reduce My Commercial Space Rent? ARE YOU SERIOUS!? What’s the matter with this sign? Subscribe to our Prepaid Business Advice Services. In today’s world of rushing from meeting to meeting many of us fall into the complacent trap of relying too much on technology to take care of us. Cars get lost in western deserts because their GPS sent them on an obsolete road. So there they are, stuck with no gas or water. But our reliance on spellcheck can easily place our drive for customer acquisition in a desert as well – from bad PR stemming from a spelling error. 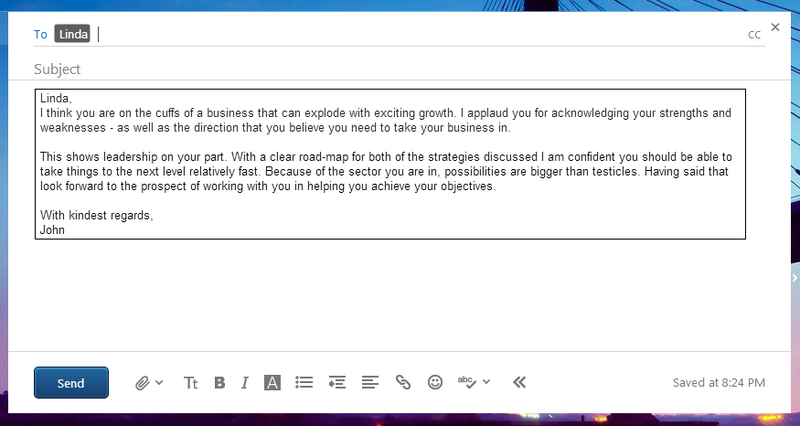 Below is an example if what I almost sent out as a follow-up to a meeting with a prospective client. I misspelled the word “obstacles.” Proof reading, I knew that it was misspelled – so I let spellcheck take care of it. Thank goodness, before sending it, I re-read the message one more time. Below is what almost got sent. Can you find what word obstacles was changed to by spellcheck? Of course when I read what almost went out, I burst out in laughter. Then the fear set in as I began thinking to myself, what if this actually had gone out unchecked? What if the prospect lacked a sense of humor or worse, was offended? To mistakes, we all react differently. Sharing this story may save you, the reader future unnecessary grief. Next time you and your team start relying too much on Spellcheck or GPS take a pause and make sure that it really makes sense.